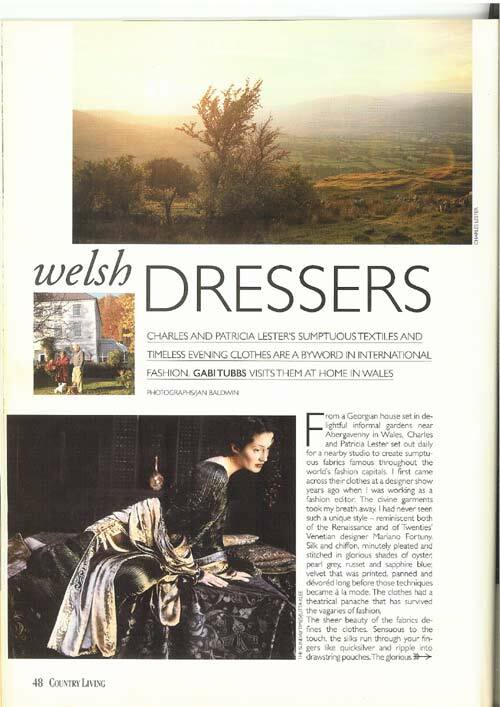 Llanfoist House has appeared in a number of publications, some are more about the clothes but some are about the house itself. These latter I will include first – as and when I remember which was which and where they are in this large house. Building. Part of a mansion built from 1690, split into two properties in the 1920’s. ——–Patricia move in, tragedy struck in the form of a major fire. ‘It was so serious that it was actually shown on the news,’ recalls Charles. Substantial damage occurred, including the loss of the roof.Even worse, as it occurred during the miners’ strike, the couple had to eat by candlelight during the power cuts.‘The fact that the house had previously been divided into three flats meant that the best kitchen was on the top floor, so we had to cook up there and bring the food down to the ground floor to eat it,’ recalls Charles. Located in grounds featuring mature trees and a pond, the house is accompanied by a ruined chapel that the couple built beside it.Ruins are a bit of an obsession for Charles and Patricia, who collect stone wherever they find interesting buildings being demolished, and hoard it for future projects.This passion for the past means that their home’s interior also exudes a timeless quality.However, the couple don’t despise mod cons by any means.The kitchen is an efficient space, while comfort is an important part of all the reception rooms. 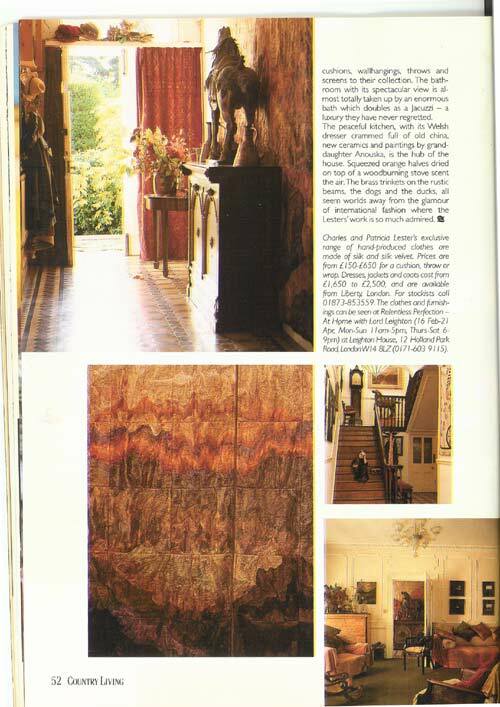 One of the most striking aspects of the house is the collection of pleated silk wall hangings.Patricia devised the technique for using signature hand pleated fabric to create tapestries and, with Charles, has transformed her little dressmaking company into a business that supplies fashion and textiles to the worlds of film, stage and opera.The couple’s work has appeared in the film The Wings of the Dove and celebrities such as Elizabeth Taylor and Barbra Streisand regularly buy from their collections.So it’s not surprising that, when decorating their home, the Lesters hung what they call ‘wearable art’ on the walls. 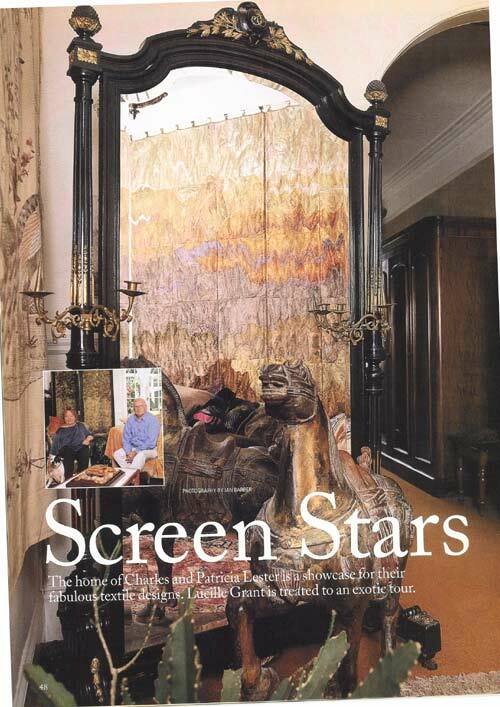 One particularly impressive item is the wall-hanging on the sitting area/landing, which was inspired by the burning oil wells of the first Gulf War, and required 100 yards of silk.‘You “lose” about two thirds of the fabric in the pleating and stitching,’ explains Charles. 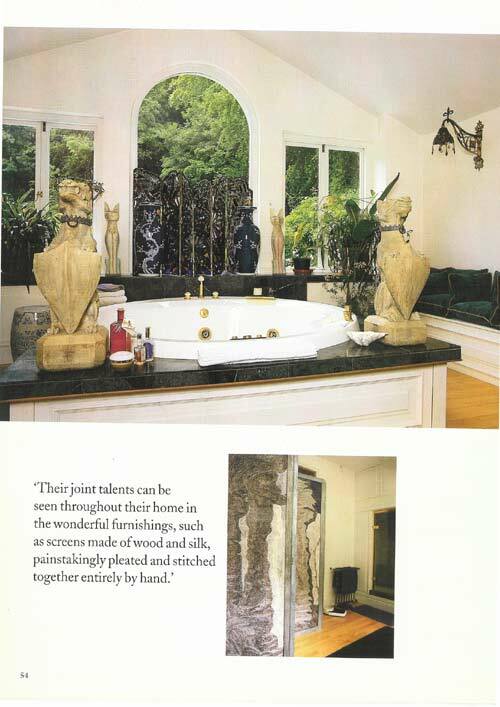 Perhaps it’s fortunate that, when this old house came on the market, the Lesters were there to snap it up.Their flair is the perfect match for this grand old property and, despite the disasters of the early days, the couple have no doubt that buying their home was one of the best decisions they have ever made. 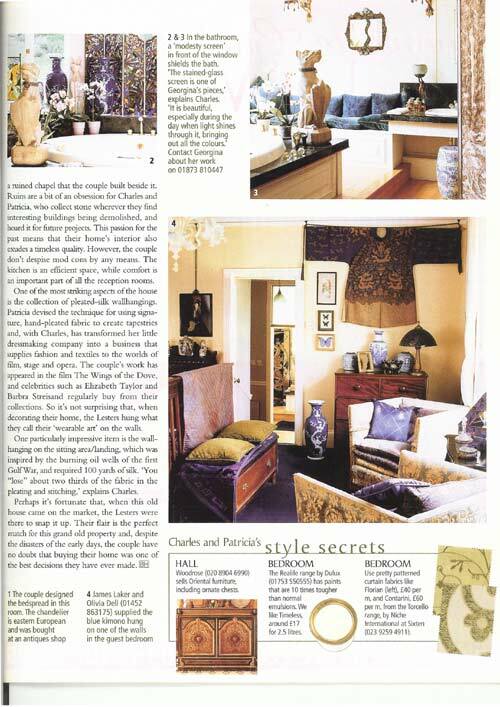 Charles and Patricia Lester’s sumptuous textiles and timeless evening clothes are a byword in international fashion. GABBI TUBBS visits them at home in Wales. Photographs Jan Baldwin. Photograph of the Welsh countryside by Charles Lester. 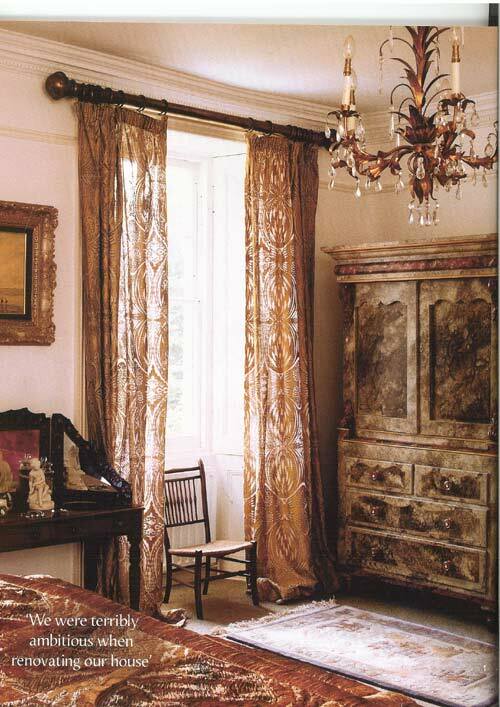 From a Georgian house set in a delightful informal gardens near Abergavenny in Wales, Charles and Patricia Lester set out daily for a nearby studio to create sumptuous fabrics famous throughout the world’s fashion capitals. I first came across their clothes at a designer show years ago when I was working as a fashion editor. The divine garments took my breath away. 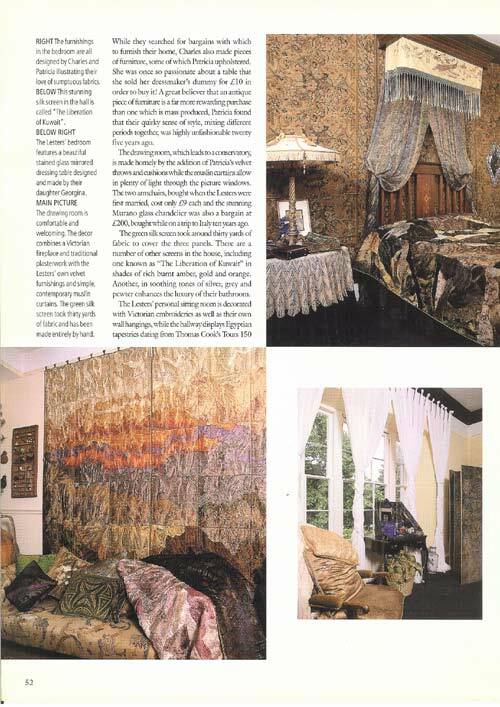 I had never seen such a unique style – reminiscent bother of the Renaissance and of Twenties Venetian designer Mariano Fortuny. Silk and chiffon, minutely pleated and stitched in glorious shades of oyster, pearly grey, russet and sapphire blue; velvet that was printed, panned and devored long before those techniques became a la mode. The clothes had a theatrical panache that has survived the vagaries of fashion. Opposite page, top view of Blorenge from the Brecon Beacons. The soft colours of the Welsh landscape surrounding the Lesters’ home and studio have often inspired their silks and velvets. 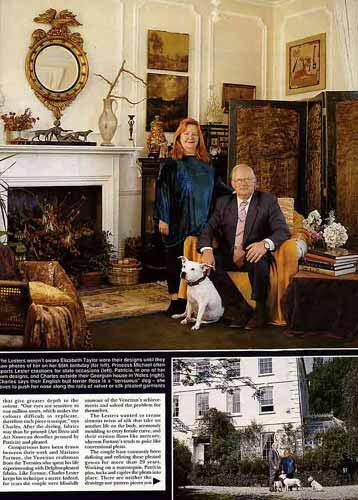 Centre Patricia and Charles Lester in front of their Georgian house with Staffordshire bull terriers Lettie (left) and Tigger (right). Below The clothes deceptively simply cut (and fabulously expensive) could have walked out of a pre-Raphaelite painting. Pleated silk dress from £1245, silk velvet jacket from £1170. 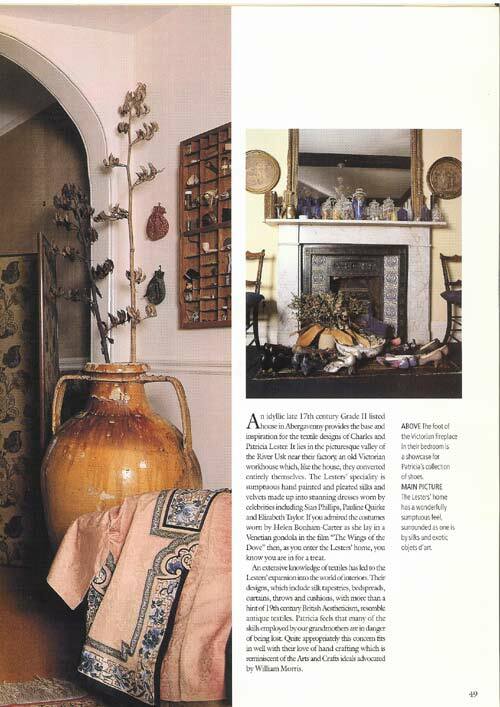 This page, above A focal point of the blue guest room is the fireplace with its blue marbled enamel electric fire which was bought for a couple of pounds. 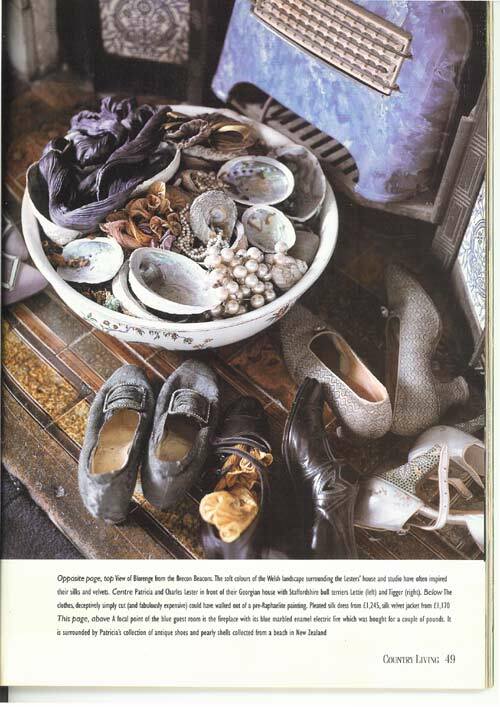 It is surrounded by Patricia’s collection of antique shoes and pearly shells collected from a beach in New Zealand. luxury of the velvets is the epitome of glamour. Devotees include Princess Margaret, Diana Ross, Bette Midler, Elaine Paige, Anjelica Huston and Shakira Caine. Angela Quaintrell, fashion buyer at Liberty, is also an enthusiastic fan and supporter. 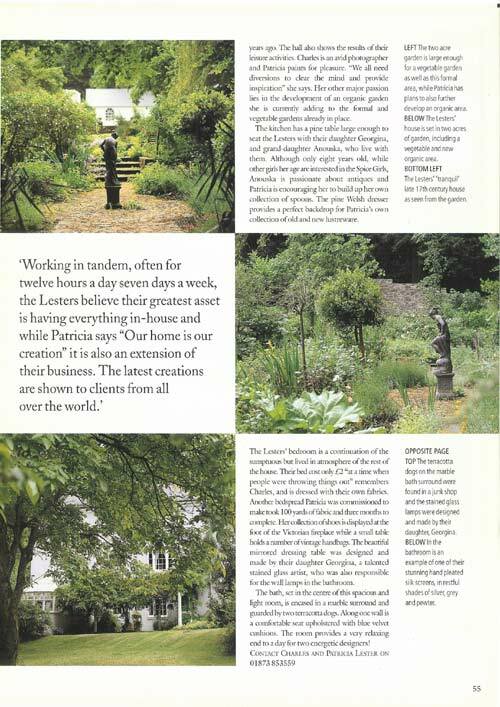 The Lesters complement each other well: Patricia designs and Charles develops the colour and printing side. 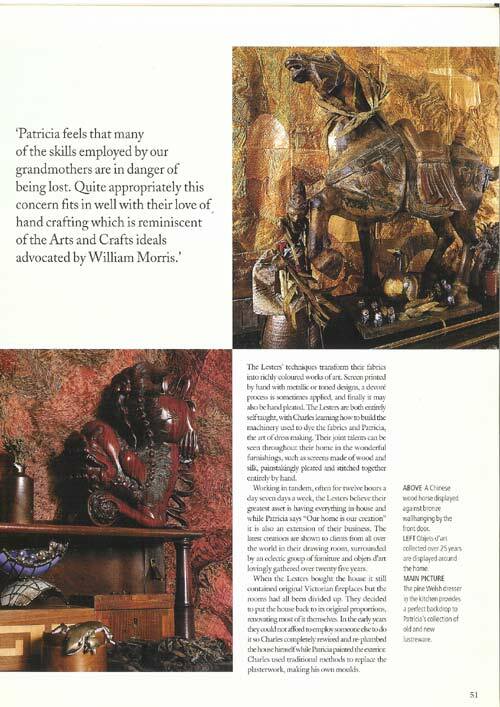 Patricia was awarded the MBE in 1988 for services to the fashion industry. Yet these astonishing clothes, the height of sophistication, are created far from the city’s fashion centers, deep in the Welsh countryside. The Lesters live in peaceful seclusion near Abergavenny, surrounded by pet ducks and four Staffordshire bull terriers. From there they drive most mornings in a classic Silver Shadow Rolls-Royce through the countryside to their studio. They found the house, built in 1750, more than 20 years ago in a terrible state of disrepair. Rotten windows were hanging off the hinges, some of the jumble of wiring dated from the Twenties, and some rooms were still lit by gas. Water pipes bled and gutters leaked, paint peeled and rendering crumbled. But it was the beautiful garden, seen from every window, that first attracted them. The previous owners spent little time or money on the house, but loved gardening. Charles now admits it was a huge financial risk to buy the property They constantly had to wait for a big cheque from sales of their clothes to continue its renovation, and Charles had to steal away from the studio every so often in order to turn his hand from silks and velvets to plaster and paint. Stripping the living room’s wallpaper and paint resulted in most of the plasterwork being lost, so Charles painstakingly recreated the plaster panel effect in the traditional way. The doors leading from the drawing room into the conservatory were originally bricked up, but have now been knocked through to allow easy access. The Lesters love to sit in their conservatory reading the papers in a rare moment of idleness on a Sunday morning — especially when the sun is streaming in and the doors leading to the garden are open. Upstairs their atmospheric textile landscapes decorate the landing walls and take on different moods as the light changes throughout the day The blue guest room walls are covered with old tapestry curtains and antique embroidery fabrics bought for next to nothing at the local market and restored from dereliction by Charles and Patricia, The room is filled with velvet cushions and hangings — originally the Lesters made them only for themselves until a visitor gave them a commission. Now they have added home accessories such as cushions, wallhangings, throws and screens to their collection. The bathroom with its spectacular view is almost totally taken up by an enormous bath which doubles as a jacuzzi — a luxury they have never regretted. 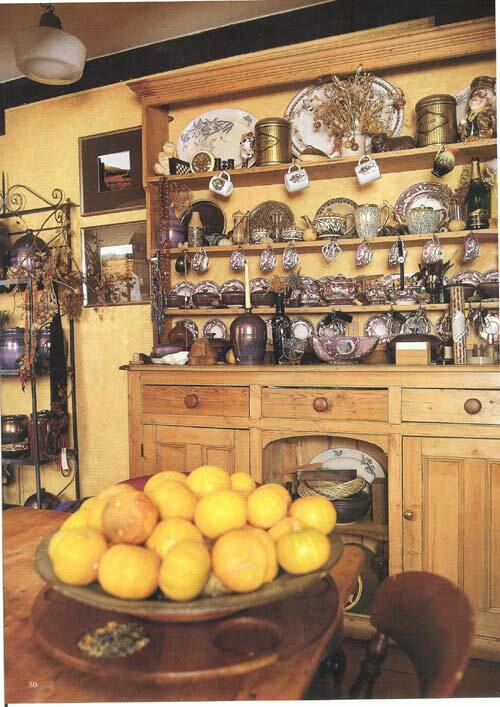 The peaceful kitchen, with its Welsh dresser crammed full of old china, new ceramics and paintings by granddaughter Anouska, is the hub of the house. Squeezed orange halves dried on top of a woodburning stove scent the air. The brass trinkets on the rustic beams, the dogs and the ducks, all seem worlds away from the glamour of international fashion where the Lesters’ work is so much admired. 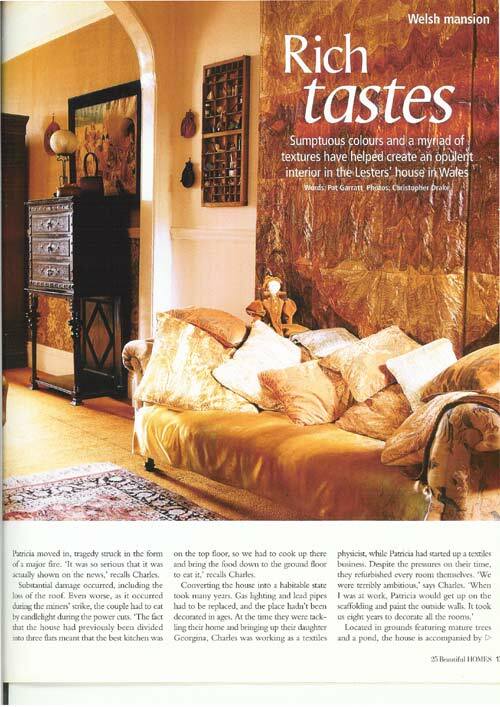 Charles and Patricia Lester’s exclusive range of hand-produced clothes are made of silk and silk velvet. Prices are from £l50-£650 for a cushion, throw or wrap. Dresses, jackets and coats cost from £1,650 to £2,500, and are available from liberty London. For stockists call 01873-853559. The clothes and furnishings can be seen at Relentless Perfection — At Home with Lord Leighton (16 Feb-21 Apr; Mon-Sun I1am-5pm, Thurs-Sat 6- 9pm) at Leighton House, 12 Holland Park Road, Landon Wl4 8LZ (0171-6039115). 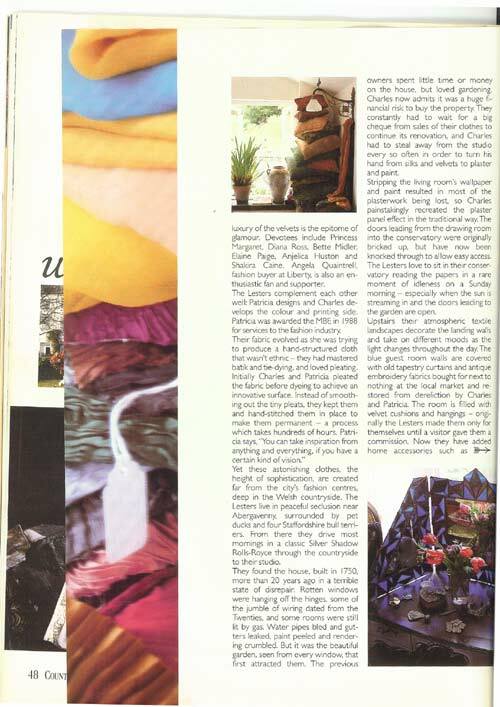 Opposite page, far left Patricia and Charles Lester’s minutely pleated silk and silk chiffon in glorious colours. Top Piled high on the bathroom window seat are velvet and silk cushions in jewel-bright colours. Below The dressing table mirror in the blue guest room, made with deep blue and iridescent glass by the Lesters’ daughter Georgina, reflects Patricia’s collection of paste jewellery. 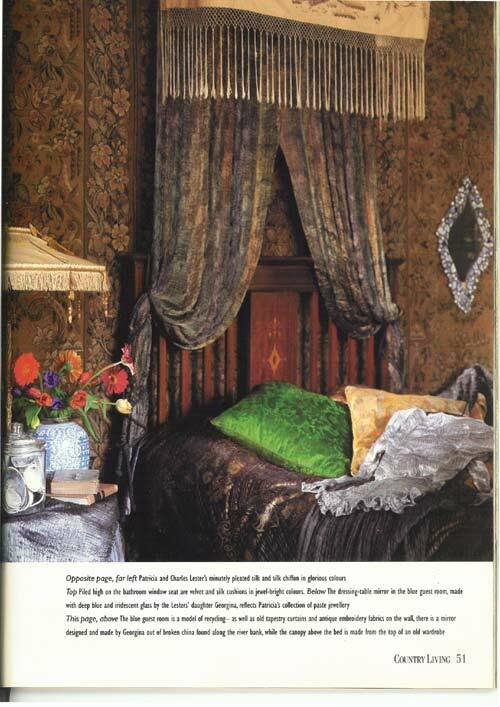 This page, above The blue guest room is a model of reclycling – as well as old tapestry curtains and antique embroidery fabrics on the wall, there is a mirror designed and made by Georgina out of broken china found along the river bank, which the canopy above the bed is made from the top of an old wardrobe. Below left Patricia’s wallhanging “Wales” was inspired by the lines and colours of the surrounding countryside. Top right Patricia and Charles’s five-year-old granddaughter Anouska models a scaled-down version of a dress designed by her grandparents. 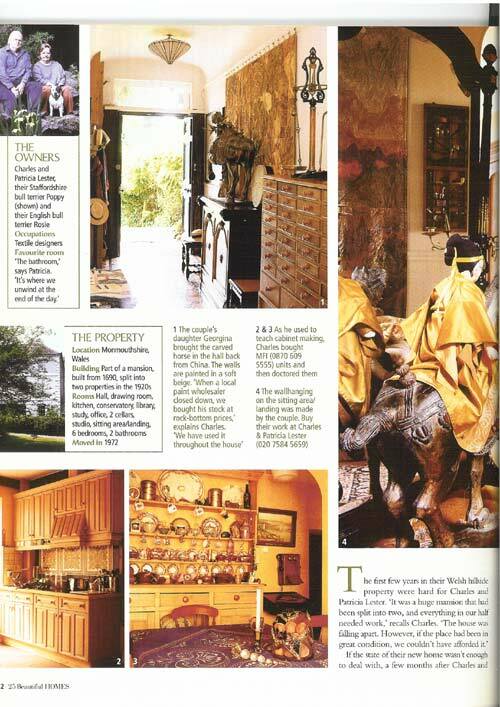 Opposite pag, top left A wooden horse, one of two brought back from China by the Lesters’ daughter Georgina, dominates the hallway. Below left Patricia’s wallhanging “Wales” was inspried by the lines and colours of the surrounding countryside. 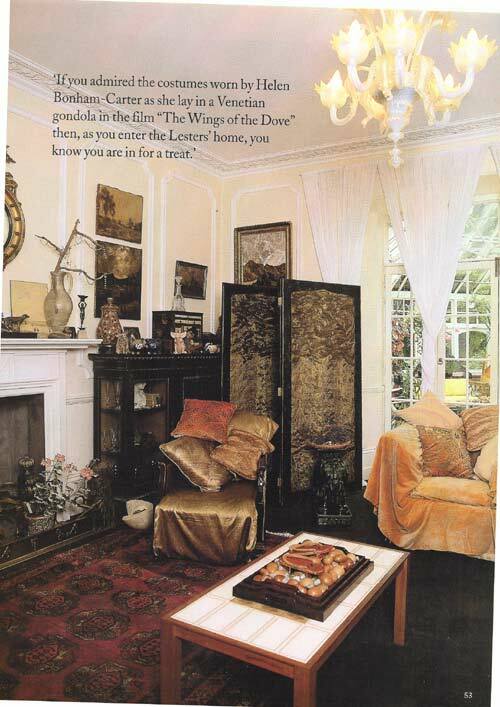 Below right A glass chandelier, bought on a trip to Venice, hangs from the ceiling of the panelled drawing room. The Lesters bought two from a factory that also supplies them with glass beads for their clothes. 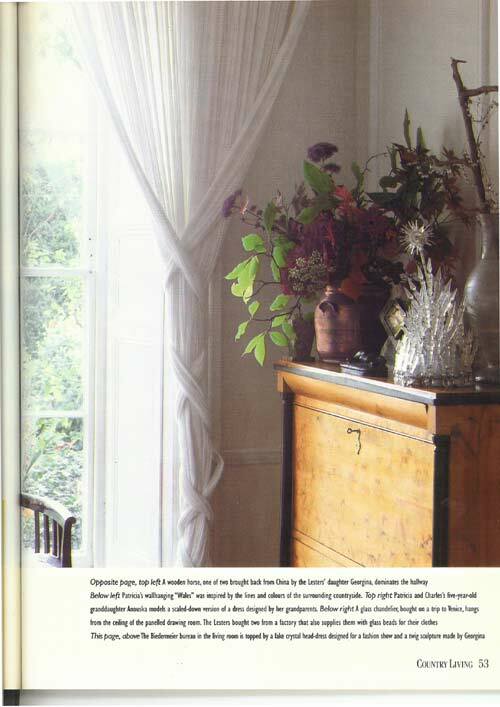 This page, above The Biedermeier bureau in the living room is topped by a fake crystal head-dress designed for a fashion show and a twig sculpture made by Georgina.